The first thing a potential employer will notice about your resume is the layout. 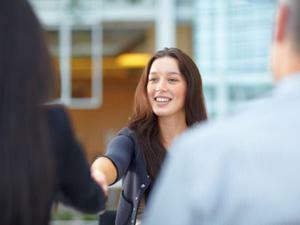 Try these tips to make sure it's a positive first impression. Imagine you're an employer, and you have two resumes in front of you. One is filled wall-to-wall with text and uses four different fonts. It's also peppered with dozens of bolded, italicized, and underlined words and phrases. The second resume also offers a lot of information, but you can quickly scan the document because it makes good use of white space, features clear and consistent section headings, and uses bullets to make important items stand out. Which resume would you look at first? If you're like most recruiters who may have to evaluate hundreds of resumes each week, you'll proceed directly to the second resume. Why? Because it's inviting to your eyes and your attention span, while the first resume is just the opposite. If you want your resume to have a good chance of being read by prospective employers, you must invest time and energy not only in its content, but also in its look. Whether you're creating your resume for the first time or in the process of revising it, you need to keep the following design tips in mind. Create at least one-inch margins on your resume. Also, leave some blank space between various sections of the resume's text, so several distinct chunks of information can be seen. It's tempting to use all of the typefaces at your disposal, but having more than two fonts in any document only lessens its readability. One font is all you really need. If you use two, make sure they complement each other. For example, use one font for the headings and the second font for the body text. It's OK to use some bolding and italicizing in your resume text. Many resume writers may bold their previous job titles and italicize subheadings within each section of the document. As for underlining—just don't. Multiple studies have shown that most readers find underlined text difficult to read. If you use all caps to present the name of your most recent workplace, for example, use all caps to present the names of your previous workplaces, as well. Or, if you use bold, centered text to present the first section title of your resume, use bold, centered text to present the remaining section titles, too. If you're consistent throughout your document, you'll subtly establish a reading pattern for potential employers that will help them follow your resume easily. In the end, you'll still need solid resume content to really sell yourself to employers. Even the most well-designed resume won't pass the employer's screen if the information it presents isn't first-rate. Just make sure the content you feature is visually appealing and quickly scannable so that instead of passing it by entirely, employers will give it the attention it deserves.